When Snowmageddon hit, Betsy and I were holed up for many days with not much to do except watch bad movies and play Scrabble. One night I wanted to cook something that would be very soothing and warming and also be great for leftovers for the next few days. Mac and cheese was the first thing that came to mind. And I don’t mean the orange powder kind. I mean real baked mac and cheese made with a good béchamel sauce. Don’t worry. Just because it’s a French word doesn’t mean it’s hard to do. Why fusilli? Well, for starters it has a lot of pun potential (Stop being fusilli and eat your dinner!) Second, it’s great at clinging to cheese and sauce so fusilli is not so silly when it comes to mac and cheese. In addition to loads of cheese, cream, and fusilli pasta, I added some frozen spinach to the dish just to give it some veggie flavor and I read somewhere that if you add spinach to something it becomes immediately healthy… joking. Kind of. Fusilli pasta baked with a cheddar and mozzarella cheese sauce. I added some spinach to give it the appearance of being healthy. 1) Preheat your oven to 400 degrees and prep all your vegetables: chop onion, garlic, and thaw and roughly chop the spinach. When you thaw your spinach, it’s always a good idea to press out some of the moisture with a few paper towels. 2) Cook the pasta according to the package. 3) For the sauce, melt your butter over medium high heat. Once it’s melted add the onions and garlic. Cook until they are soft, then add your flour flour to the mix. Whisk this all together to make a roux. Cook it for a few minutes until the flour takes on a light tan color. 4) Start adding the milk to the pan slowly, whisking constantly. Work slowly and whisk out any lumps that form. This works a lot easier if your milk is warm, but you can do it with cold milk also. 5) When all your liquid is incorporated, continue to whisk over low heat. Remember, there will be some lumps in this sauce because you have onions and garlic in there. 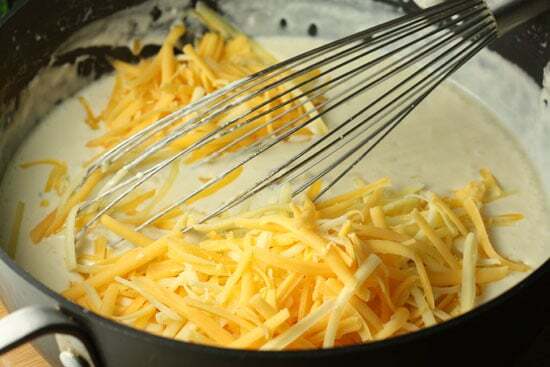 6) Once your sauce is the consistency of a light gravy, add in the cheeses and continue to whisk until they melt. Add any spices you are using at this point. 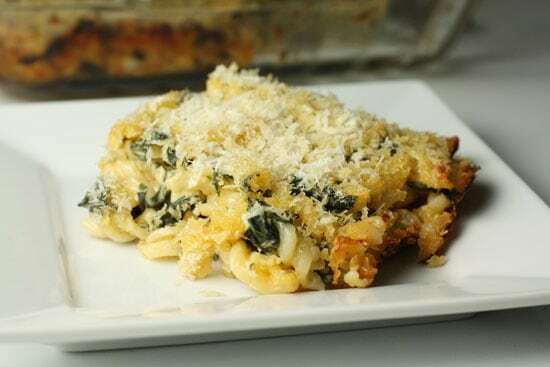 7) In a large bowl, combine the cheese sauce with the pasta and spinach. Season with salt and pepper. 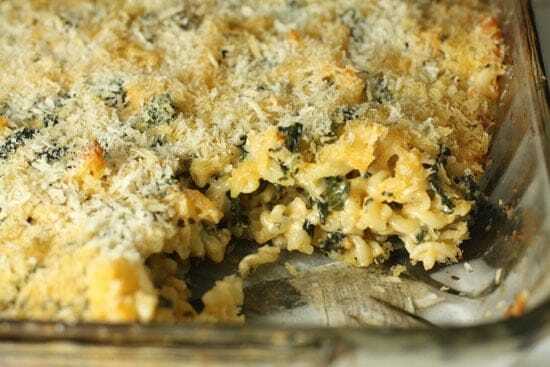 8) Lightly butter a baking dish and pour in your cheese fusilli. 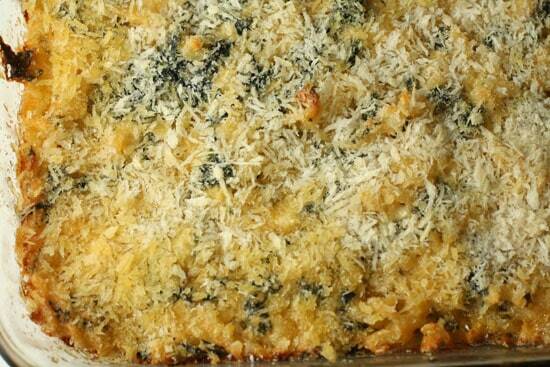 Coat with bread crumbs and grated Parmesan. 9) Bake this whole thing at 400 degrees for 30-40 minutes until the edges are nice and crispy. 10) Let it cool for five minutes before serving. It might look like a lot of ingredients, but trust me, it’s worth it. You can substitute a lot of different kinds of cheese based on your favorites. I just used these because it was what I had in my cheese drawer! Before I really start cooking this dish I like to get everything ready because once you start cooking the béchamel sauce you don’t want to leave its side. Start by preheating your oven to 400 degrees and getting a large pot of salted water boiling. 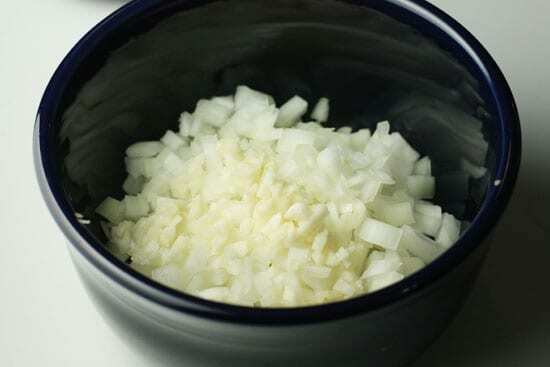 Remember that a good ratio is 1 Tablespoon kosher salt to 1 gallon of water. You can cook your pasta according to the directions on your package once the water is boiling. Also, chop up your onion and garlic. The base of the sauce. Now would also be the best time to get your spinach ready. I just thawed mine in the microwave and then gave it a very rough chop. 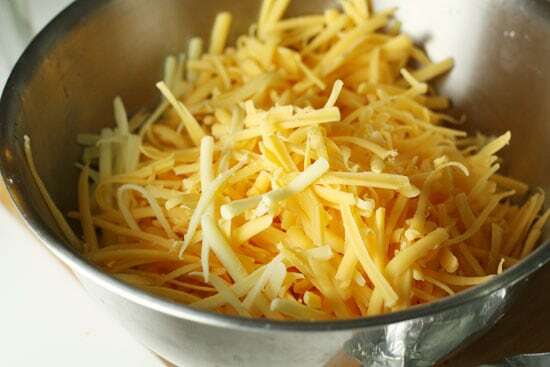 And don’t forget to shred that large amount of cheese! Could you add more? Of course. 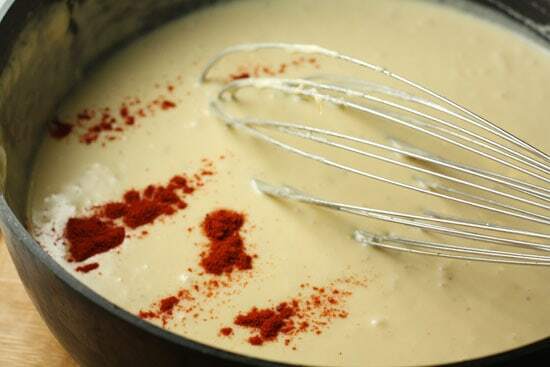 I decided to do something a bit different for this béchamel sauce and it worked great!I’m pretty sure that I saw this on the Food Network or something and remembered it… I just can’t remember where exactly. Anyway, start by melting your butter over medium-high heat. 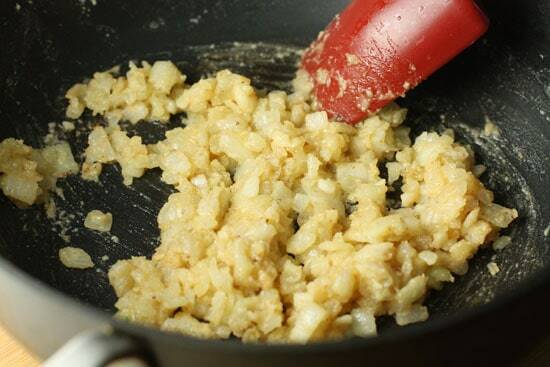 Once it’s melted add your onions and garlic to the butter. Cook them for a minute or two until they are soft and then add your flour to the mix. So it’s like a standard roux except with onions and garlic mixed in. Not exactly traditional, but it works. Keep an eye on this and continue to stir it over medium-high heat for a few minutes. It’ll get really thick and become a paste. Continue to stir it until it turns a very light tan. It should take maybe 4 or 5 minutes. You basically just want to cook the flour taste out of the flour. You don’t want to make a really dark roux. Now comes the only tricky part in this whole recipe. You need to smoothly add your milk and cream to this roux. If you add it too slowly, it’ll clump up really badly and if you add it to quickly you’ll end up with lumps. So the trick is to first combine your milk and cream into one container. Then get your favorite whisk ready in your right hand (or left hand if that’s your style). Then just slowly pour the liquid into the pan, whisking constantly. Once you get about half of your liquid incorporated, you can add the second half of your liquid faster – still whisking the whole time though. Then turn your heat down to low and continue to whisk. If there are a few lumps, don’t freak out about it. Just whisk for a minute or two and most likely any large lumps will smooth out. Also remember that you have onions and garlic in there, so those will be lumps that are impossible to get rid of. Once your sauce it thick enough to coat the back of a spoon (it’ll take a few minutes to get there), add all your cheese about 1/4 at a time. Whisk it together! Don’t worry. It will all fit. But eventually it will all melt and you’ll have a perfectly wonderful sauce. If you’re using the spices, which I highly recommend, add them now. Remember that pasta you were supposed to be making? Well, don’t forget about it! Make sure you don’t overcook it or your final cheesy fusilli will be kinda mushy. Once it’s done, drain it and set it aside. 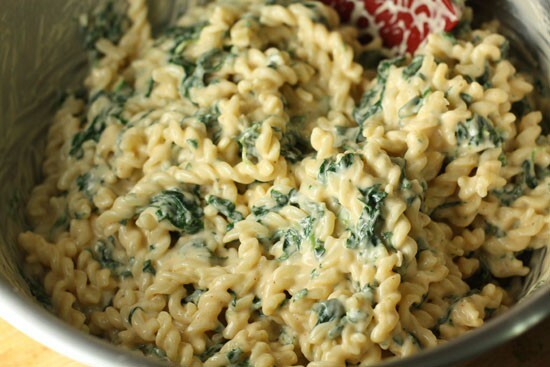 Then in a large bowl, combine your pasta with your cheese sauce and your spinach. At this point, I like to taste for salt and pepper. You’ll probably need a good large pinch of salt and a good dose of fresh cracked pepper also. It’s honestly not bad like this! Remember to lightly butter your baking dish before you add your cheesy fusilli to it. Otherwise it’ll stick pretty solidly to the sides of the dish and you’ll have a heck of a time getting it out. But once it’s buttered, pour in all your cheesy fusilli and spread it out so it’s even. 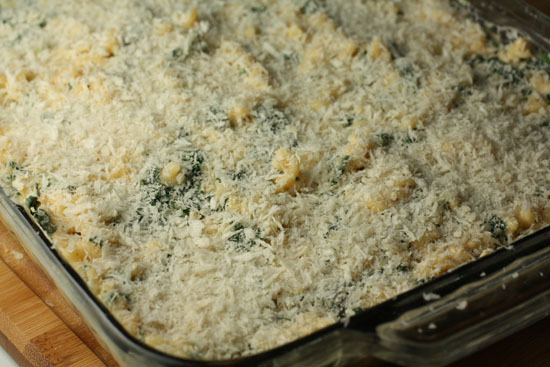 Then coat it with your bread crumbs and grated Parm cheese (use as much as you see fit). Bake this at 400 degrees for about 30-40 minutes until the edges are nice and crispy and the middle is melted and delicious. It’s going to be hard, but let this cool for 5 or 10 minutes before serving it up. You’d be fusilli not to try this. This just goes to show that if you add a delicious cheese sauce to any pasta really, it’s going to be wonderful. The recipe is pretty flexible actually. 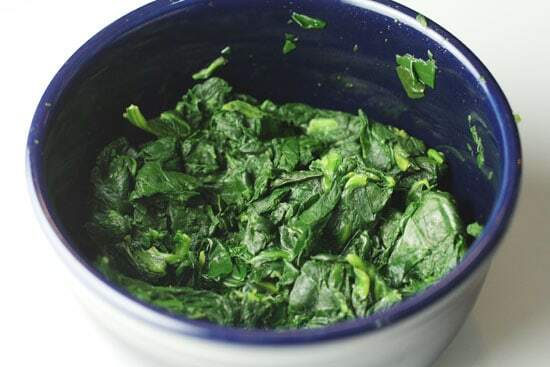 You could decrease the amount of cheese or eliminate the spinach or spices without too much problem. In my opinion though, that’d be kinda fusilli. This looks YUMMY! 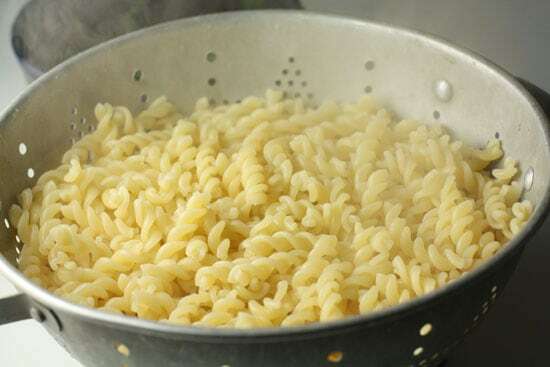 Just wanted to say, too, that I can't even think of fusilli without being reminded of Kramer's "Fusilli Jerry" from Seinfeld. Love it! Umm yea! Most important part of my kitchen! My favorite substitution in any mac 'n' cheese dish is pepper-jack cheese. Nothing like comfort food with a kick! Looks great. Is this not comfort food or what?! YUM! looks real good…and next time youre over im breaking out the deluxe edition of Scrabble (rotating board). julie doesnt like it, I love playing. Anyway, Scrabble reminds me of scrapple, which is soooo good. ever consider trying to make it? I will destroy you at scrabble! Ok. Maybe not… but I'll talk a lot of trash while losing! Dammit, I was hoping to use that punny comment! Great looking dish. But I could have just eaten it at the “it’s not bad like this” photo. Cheese pasta together — what's not to like? I like the addition of the spinach. Definitely a great way to get a little veg in my diet, which I never get enough. I have taken to mixing up the type of cheeses in this type of dish. I find it keeps it from becoming to similar from one time to another. That said, I do love a good extra sharp cheddar as a base. It is always like old home week when you get the taste just right. Thanks for the post! Looking forward to more. I do have a confession to make, and I realize that I’m likely in the minority here, but I like my mac and cheese sauce real gooey. 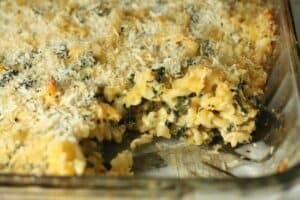 Every baked mac and cheese recipe I make ends up a bit thick and dry; I almost prefer it the way it is BEFORE it goes into the oven, but then again, it wouldn’t be as piping hot as it needs to be and the crumbs wouldn’t be nicely toasted. Its Yum !! I tried it and is delicious, the only extra thing I added was bell-pepper, the aroma was fantastic, taste was super yum. I liked it very much. thanks a lot for this delicious recipe. I loved it ! !